And baby Lane's double chin. :) Oh Lane. I just want to squeeze you every second! I hope your week is going well! It's been warm and beautiful here lately. Well, I'm relaunching my business after taking some time off to have a baby and thought it'd be fun to do a Mother's Day giveaway (appropriate, right?) of a Custom Home Portrait in acrylic. The photos above are an example of what you'd receive if you won the giveaway- a 5x7 illustration of your home on a cradled wooden canvas. I want to run the giveaway now so that there's plenty of time to paint and mail out the portrait before the big day. To enter, just drop your email in the box below. That signs you up for my newsletter. If you're already on my newsletter list, you don't need to do a thing because you're already entered in the giveaway! The giveaway will run at the beginning of next week and winner will be notified via email. 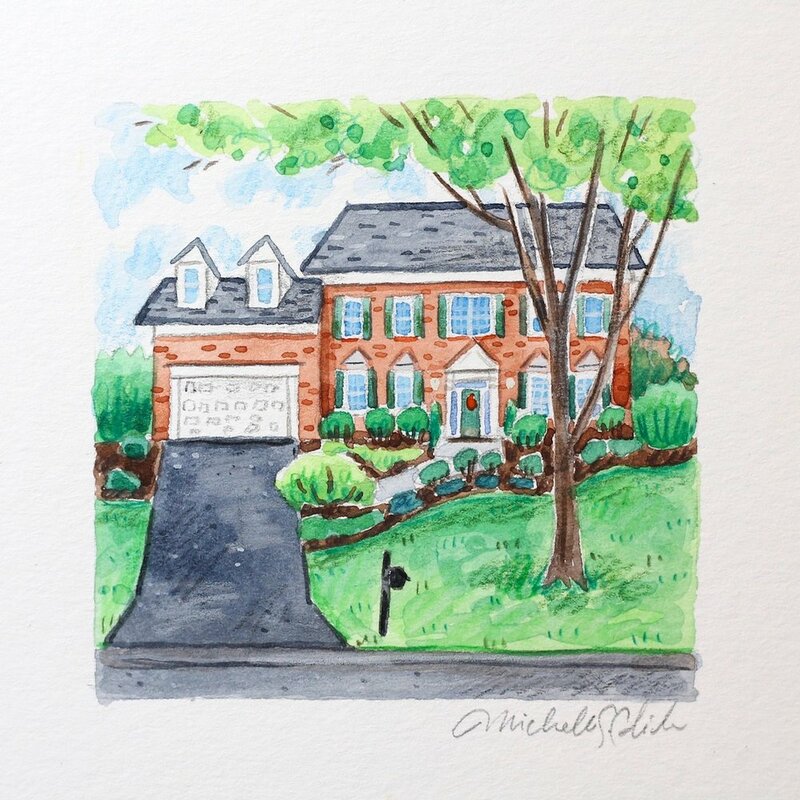 Enter your email address below for a chance to win a Custom Home Portrait! This week, now that all the gifts have been received and I'm not spoiling any surprises, I'll be sharing a collection of my favorites from the over 60 custom ornaments I painted last year. I still can't believe I was able to get that many ornaments out the door in time for Christmas (Lord knows the panic I felt at times! ), but alas, my customers are the best and most supportive people in the world and came back over and over to purchase more. By far, the bestsellers were the Home Ornaments. I plan to paint many more this year, but won't be officially starting holiday orders until September 1st, 2017. I really appreciate that people are already starting to purchase gift certificates for this next season because it helps me prepare and gather a Wait List. To add your name to that list, simply purchase this listing. Thank you again for making my Christmas season so special!